Mike Isaacson is an Antifa activist and a Criminal Justice professor who teaches aspiring cops (wrap your head around that) at John Jay College in Manhattan. He looks more like a giraffe with a really bad haircut, but that’s what passes for professional educators these days at American universities. 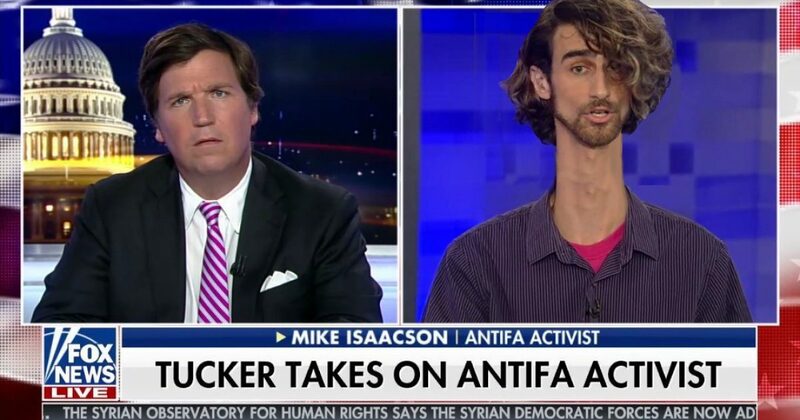 OK, the photo, above, was photoshopped a little, but his incredibly long neck (Malia Obama) was the first thing I noticed about him. In fact, it was so distracting, I was having trouble concentrating on the anti-American stupidity he was spewing. Watch as Isaacson tries to convince Tucker Carlson that Antifa has every right to beat the crap out of Trump supporters because their very language is violent and justifies self-defense in the form of ganging up on them and beating them to a bloody pulp. He is advocating denying an entire class of people (Trump supporters) their First Amendment rights. It is hard to believe that he is teaching aspiring cops, who will one day swear an oath to support and defend the very Constitution that he believes he and Antifa have the right to violate.